Do You Want Fries with That Order? Pierre: “It is terrific to be able to check off our gift list so quick and easy with PrideBites. Now that we know what we are buying ourselves our friends, we can relax and let the mailman deliver the goodies right to our door. Christmas shopping has never been so simple." that is the tastiest toy-idea I ever saw!!! is ther mayo and ketchup too? They don't have condiments but you'll love the burger and fries. 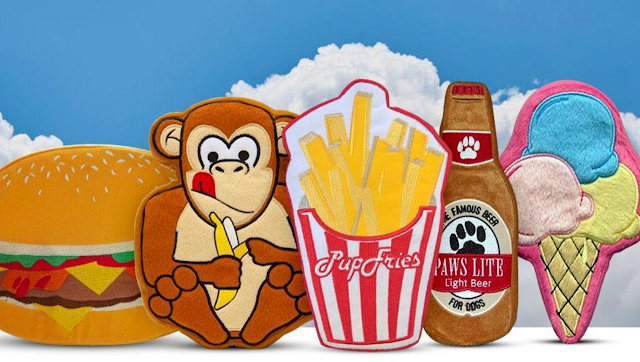 That fries toy looks good! Maybe not Whataburger fries good . . . There are no fries like Whataburger fries! LOL! I know! Don't they look fun and tasty?! 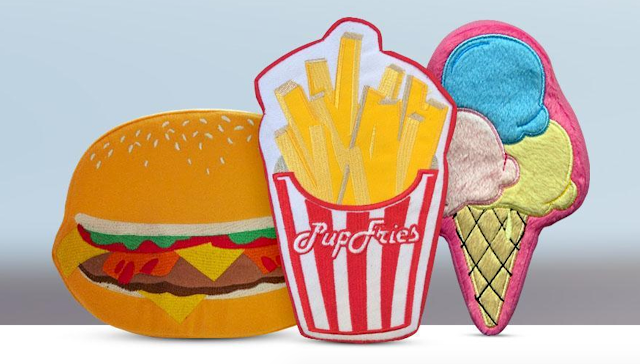 Those are cute and yummy looking toys. Fries please! 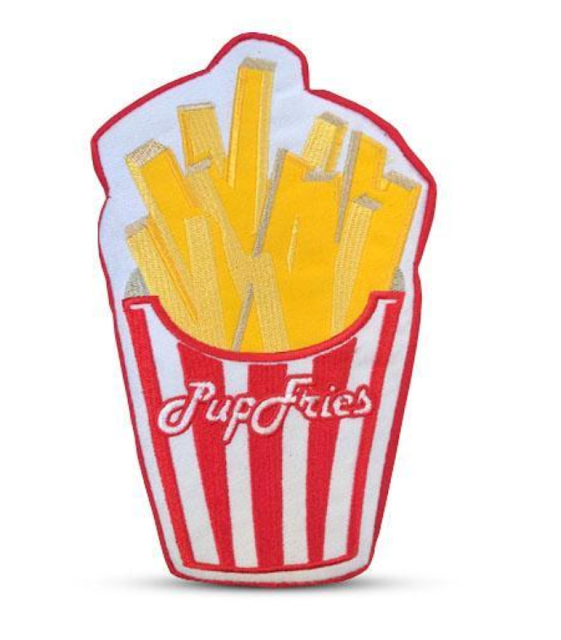 The Pup Fries are so darn cute. We love their cute toys, but we have some and don't play with them much, so not getting any more. If playing is not the girls' thing, PrideBites has collars, harnesses, leashes, clothes, beds, blankets, towels...well, you get the idea! What a great idea for Christmas pressies. I think so too! We have several dogs that we buy for and this is a great combo. Those really look like fun toys! They should make catnip ones for us cats. I have yet to meet an indestructible squeaky toy. Bring it on! Pierre has yet to kill one! 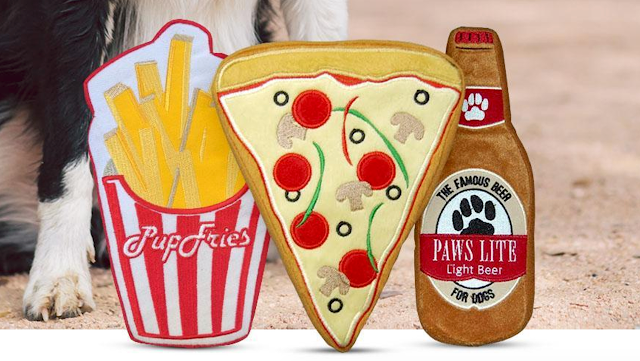 That is super cool and the dogs that used to live here loved fries, and pizza crust too! The boys love pizza crust and fries too! Maybe that is another reason they love their PrideBites toys! Because EFFURYBODY loves pizza and fries! Such fun toys. EXACTLY and I have never met a cheeseburger I didn't love. The pizza is one of Pierre's favorite. They both look funny with the slice of pizza hanging out their mouths. LOL! Oh, we are sooooo jealous! Maybe we can talk the folks into visiting Whataburger. Jakey says he would love tip rip into one of those Paws Lites during the Puppy Bowl! That's the spirit, Jakey! Tailgating!! FRIES??!!! Oh I DO loves me some fries!!! once in awhile Ma drops one and I gets it before she can snag it up! Oh, they are delish! Butts, I thinks I have to go with the beer one...yeah, you knows ME! BOL!! These are so cute! You are right, they would make a perfect Christmas gift, and Luke really needs to try these toys out! You had me at fries! That is my personal addiction! And you had my FiveSibes at pizza! These are so cool! Love the review! Your Dog has Cancer. Now What ?